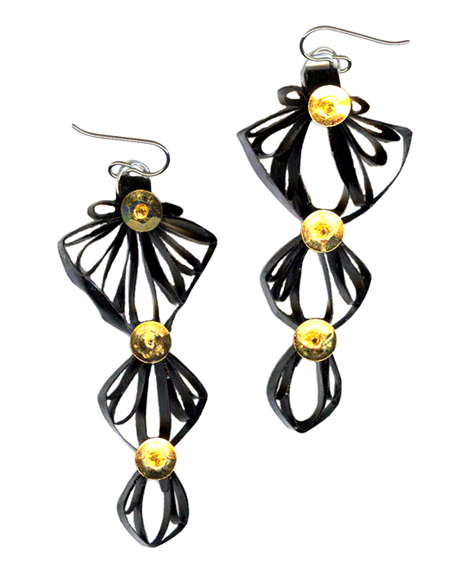 � These elegant black dangling earrings with gold sequin and bead accents will set you apart in their unique design. Graceful filigree, these earrings dangle without the pull of their heavier cousins. Created by the art of paper quilling by Jo Davis, they are light-weight and made for delicate ears. Beautifully crafted earrings have a protective polyurethane coat which adds sturdiness. They are water resistant, but not waterproof. Made with titanium french hook style earwires, our earrings are suitable for metal sensitive ears.� For those that prefer niobium, the titanium french hook style ear wires can be replaced with niobium ear wires for $1 more. Choose between titanium or niobium ear wires when placing your order.